You are preparing for one of the most important relationships in your life. Our Marriage Preparation Program will help you and your partner build a solid foundation for your future, focused on mutual understanding, respect and support. Together with our trained counselors, we will work with you to further strengthen your friendship, enhance your intimacy, develop empowering, healing patterns of communication and ultimately prepare you for a life of love, shared goals and values. Choose the option that works for you below! 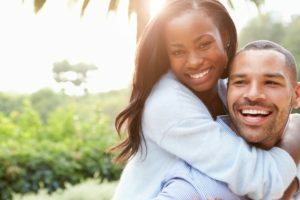 In three private sessions with a therapist (certified in using the Prepare/Enrich inventory), you and your partner will: identify strengths and growth areas; learn ways to strengthen communication skills and resolve conflicts; identify and manage major stressors; develop a more balanced relationship; and begin to understand personality differences and maximize teamwork. Once you have registered and paid for the couple sessions (see the buttons below), your therapist will contact you and provide a password for you both to go online and answer the Prepare/Enrich pre-marriage inventory questions. Your therapist will use the information provided by the Prepare/Enrich inventory to tailor your sessions. After your sessions are complete, your therapist follow up with a letter to the priest/pastor marrying you. Because of the ability to tailor sessions, we highly recommend this option for couples whom this is not a first marriage, couples that have been living together for awhile, and couples who have already started their family. The cost is $295. There is an additional $35 cost for the inventory that you pay directly to Prepare/Enrich. Register and pay through PayPal below. Or send your name and a check to NCC, 8383 NE Sandy Blvd. #205, Portland, Oregon, 97220. This option allows the couple to meet with other engaged couples in a group setting. The workshop is facilitated by trained therapists, providing a broad spectrum of experience. The workshop features presentations to the group and allows for each couple to work individually on exercises and activities designed to increase self-knowledge and knowledge of each other, and to build skills in communication and conflict resolution. This is a great start to those important conversations you will continue throughout your marriage. In addition to other necessary skills, the workshop also presents an understanding of marriage as covenant. These workshops meet on Saturday from 9am-4pm and are $225 per couple. Complete the registration form, then pay for the date you choose using the buttons below. Or send your name and a check to NCC, 8383 NE Sandy Blvd. #205, Portland, Oregon, 97220. This is the most comprehensive of our marriage preparation options, and couples consistently tell us they greatly benefit from the two experiences. When you have registered and paid for the couple sessions plus workshop, your therapist(who is certified in using the Prepare/Enrich inventory) will contact you and provide a password for you both to go online and answer the Prepare/Enrich pre-marriage inventory questions. Your therapist will use the information provided by the Prepare/Enrich inventory to tailor your sessions. We offer both the workshop (on Saturday from 9am-4-pm) and the three private sessions at the discounted cost of $395. There is an additional $35 cost for the inventory that you pay directly to Prepare/Enrich. Complete the registration form and pay for the date you choose by using the buttons below. Or send your name and a check to NCC, 8383 NE Sandy Blvd. #205, Portland, Oregon, 97220. Please email marriageprep@nwcounseling.org or call 503-253-0964 for more information.